A creative life came naturally and early for Cape Cod artist Andrea Pettito. Her father was a sculptor and her mother a painter. Both of them had gone to art school. She can’t recall many children’s books in the family home, but from the age of 3 on she spent a lot of her time pouring over the pages of her father’s books of Michelangelo and Rodin sculptures. Those sculptures fascinated her. Her favorite childhood “toy” was plasteline, a greasy gray clay that her father used. She made all kinds of things, including people, animals and objects. She also loved to draw. Andrea was a self-described nerdy child and her high school didn’t have a good art program. Both science and art appealed to her and she ended up choosing science. On her resume she lists the scientific part of her life as “Miss-spent Youth”. The listing includes degrees in biology and cognitive development completed at Tufts and Cornell, followed by research at Harvard Medical School. She served as an Assistant Professor at the University of Rochester and as an industry consultant for over 15 years. It wasn’t until the late 1990s that she returned to her first love. Throughout her academic education and career Andrea always used art as a means to relax. She occasionally took art classes in design or drawing. In 1997 she took a course in oil painting at a local community college and was hooked. Since then she has studied with many fine painters and spent countless hours in classes and live model sessions. Dogs have always played a role in her art. She has included every dog that she’s ever had in at least one painting. Her first dog, a Dalmatian named Boon Doggle sometimes supplied subject matter by bringing things home, for instance, a couple of interesting animal skulls. 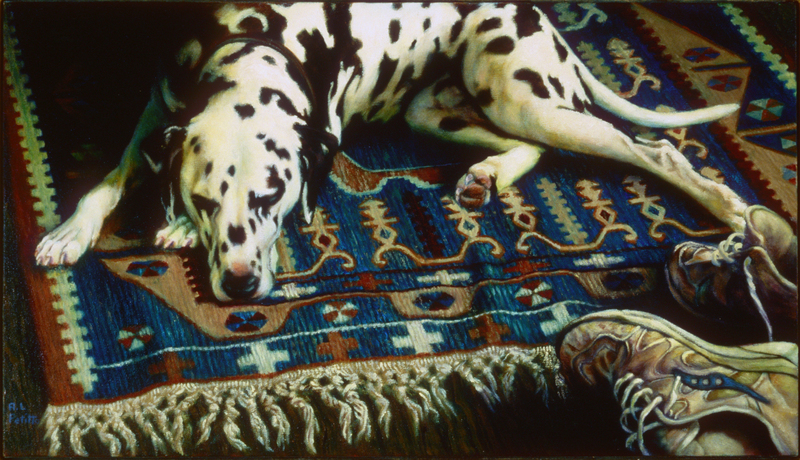 One of her best paintings is of “Boon” lying on a colorful Turkish kilim rug. While the dog in the painting impressed viewers, the really difficult part for Andrea was that rug! Because Andrea had spent many years intensively studying drawing and painting the human figure it was not hard for her to grasp the anatomy and structure of dogs. As a dog owner, the emotional significance of their body language is very familiar to her. Paintings naturally flowed from this relevant background. 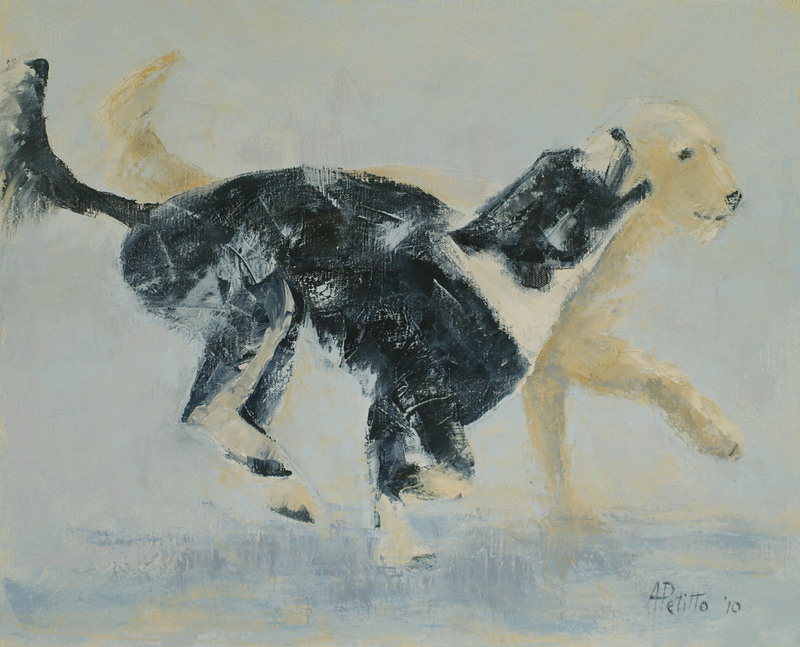 Andrea often creates series of paintings, whether it is farm stands, Cape Cod landscapes, humans or dogs. Her favorite dog series is “Beach Dogs”. It began shortly after moving to Cape Cod and becoming involved in a local gallery. She felt compelled to paint local subject matter but wanted to avoid the usual boats in the water scenes. She and her husband Bill walk the dogs early every morning along the shore. There they encountered other people with their dogs and it occurred to her to take photos of these encounters. 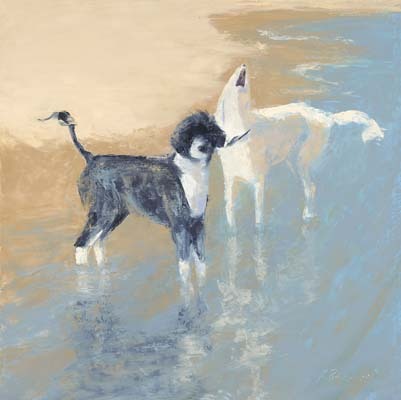 The combination of dogs, light, water and sand were inspirational. 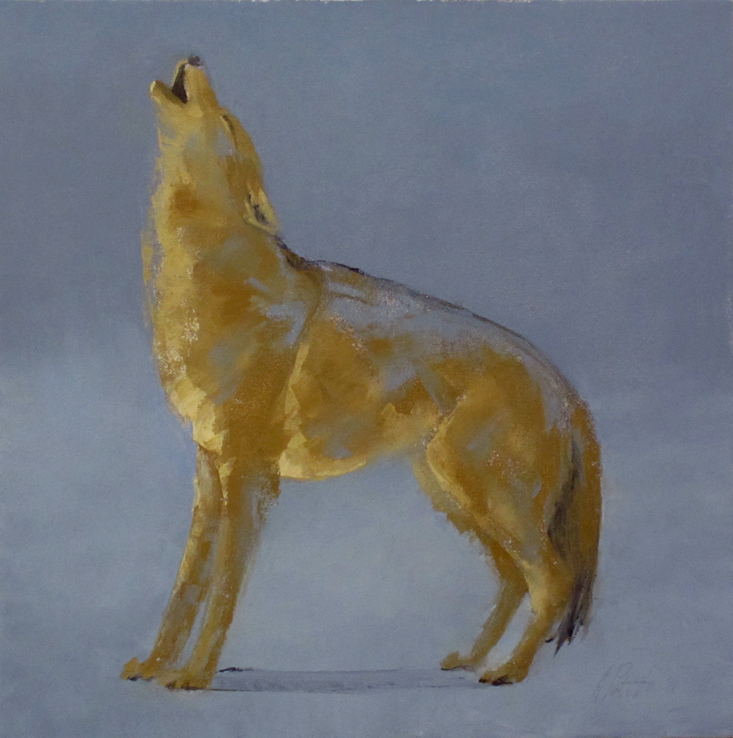 She easily captured the expressive body language of the dogs in this environment. Another interesting dog-related series is of coyotes that began with her cousin’s dog who has a very coyote-like face with a “sly, suspicious” expression. Andrea found the dog fascinating to observe, so she photographed him. After beginning sketches of the dog the images turned into a coyote and she went with that. 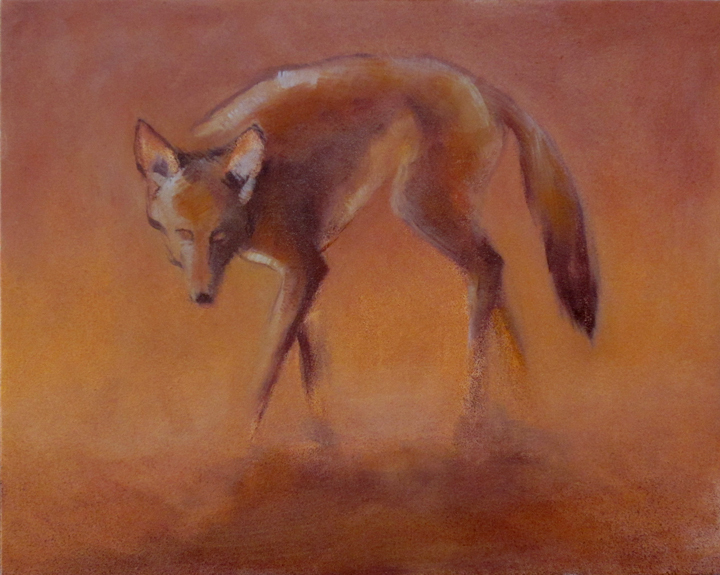 The coyotes have been much harder for her to paint because she feels a lack of understanding and knowledge of this species to convincingly capture them. Andrea and her husband have two dogs, Spangle, a labradoodle who is the subject of “Spirit Dog” and Maddie, a Portuguese Water Dog. Maddie and Andrea are a very accomplished agility team, with several titles to their name. As previously mentioned, Andrea’s first dog was a Dalmation named Boon Doggle. He was greatly admired for being a gentleman and for his love of children. Andrea has also raised a Labrador puppy as a guide dog who went on to work for a man in Ohio. Andrea finds dog training and performing together as a team the most satisfying way to relate to these wonderful animals. The relationship that builds between working partners is far beyond the usual human/dog relationship. She strongly feels that it not only improves the dog but that it makes the human involved a better person. Plus it’s a great way to get more exercise. Andrea’s work is available through galleries and her website. This entry was posted in Art and tagged art, dog art, dog paintings. Bookmark the permalink.